The Long and Short of Starter Adapter Replacement | Tennessee Aircraft Services, Inc. There has been a great deal of excitement and concern expressed lately about starters and starter adapter failures. Some starter designs may be causing premature adapter wear. Some starter designs may be causing adapter spring failure if an engine “kicks back” during a starting event. Some adapters work fine until a new style starter is installed, then within a handful of starts, the adapter begins to slip during starting. Some of these problems are real and some may be forum fodder. These are all things this article is not about. 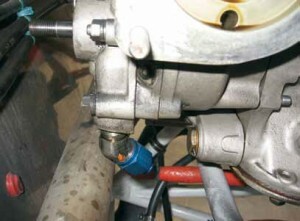 This article is about the “simple’ process of replacing the starter adapter. Our sample airplane happens to be a 2008 Cessna 400 with only 180 hours since new. One wants to ask why a 180 hour starter adapter would begin to slip but that’s another subject this article is not about. As always, the first step in maintenance is toward safety. Disconnect the battery or disable the electrical system in some way before you start. 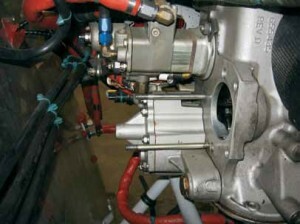 The starter is removed first by disconnecting the power wire from the electrical post on the starter and returning all hardware to the starter so it can be found later. Remove the two starter mount bolts while supporting the starter motor. The starter should easily lift away from the engine. So far we’ve spent about 10 minutes, not including cowling removal. So far so good. On this model plane, the starter adapter mounting hardware are studs attached to the engine case. Two of them are several inches long creating the main challenge. To remove the adapter, we must be able to slide it towards the airplane’s firewall far enough to get it past the longest stud. At first glance, the only way to remove the adapter is to move the engine forward about three inches. Remove rear alternator tension bracket. Remove rear exhaust crossover and waste gate. Remove left and right air filter duct hose for mount bolt access. Remove oil lines from starter adapter. Remove upper bracket from mixture cable. Remove clamp holding left EGT and CHT wires to the engine mount. Install lifting point to rear of engine. Disconnect wire from prop heat block. 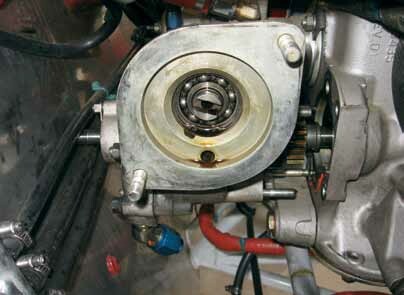 Disconnect oil line from left and right turbocharger waste gates. Disconnect oil lines from left and right turbochargers. Remove clamp from alternate air cable. Loosen clamp on main fuel supply line on left side of engine mount. Starter adapter slid back about 1/2″ hitting exhaust cross over. 45 degree oil line fitting doesn’t have room to rotate for removal. “Reinstallation is reverse of removal.” Not really, but that’s what all the car manuals used to say and I just couldn’t resist. And don’t forget to install the replacement adapter before you put the engine back in place. If the problematic long adapter mount studs could be removed with the adapter instead of staying on the engine, the job is not only shorter but the risk of maintenance induced failures is also reduced. I subscribe to the theory that the less we disturb, the less opportunity for problems with those peripheral systems. Engine installations vary so you won’t know if this method works until you try. Exhaust cross over removed and adapter now slid aft about 2 inches hitting the firewall. Once the engine is fully exposed and all safety precautions have been taken, we still remove the exhaust cross over tube. The oil line on the bottom of the adapter is removed and the nuts on the short studs are removed. The short studs are the ones that stay with the adapter and are closest to you when viewing the adapter from the right side of the plane. Next, remove the nuts and washers from the two long studs located on the more inboard portion of the adapter. Install both nuts on the same stud until they touch the adapter. If the stud threads are long enough, you should see at least one thread protruding from the last nut. Using two wrenches tighten the two nuts against each other. This should create enough friction to lock the nuts on the stud. Using a wrench on the nut closest to the adapter, slowly apply torque to remove the stud. In a perfect world the nuts stay locked to the stud, and the stud then turns out of the engine. Repeat this maneuver on the second long stud. Once both long studs are free of the engine, the adapter assembly with the two long studs will angle out of the engine to the right side. If all goes well, the adapter is removed and the studs are reusable. “Reinstallation is reverse of removal.” If the jamb nut process doesn’t work, a second stud removal method may be employed but does require a sacrifice. Let’s back up to the point in the adapter removal process where we removed all four of the stud mounting nuts. Slide the adapter aft until it contacts the firewall. The only two items preventing removal will be the long studs. A pair of vise grip pliers can be clamped on the threads of the stud near the engine case to turn the studs out. Once the two studs clear the engine, the adapter can be removed. The unknown in both of these long stud removal methods is the reinstallation of the studs. The new studs are installed to a particular torque and depth into the engine. The jamb nut method can be used to reinstall the studs with the placement adapter, but lack of thread depth at the aft end of the studs may prevent full installation. The “out” at this point would be lifting the engine as was done in the beginning of the article. Engine “relocated” and adapter removed. Note the 2 very long stud still in the case of the engine. An early indication of adapter failure is the prop pausing during a starting event while you still hear the starter motor turning. A weak battery might cause similar symptoms, and the use of external battery will make the problem go away, for a while. Eventually, the slippage gets to the point the prop won’t make it past the first cylinder’s compression. Labor for this replacement can range from four hours up to the middle teens, depending on the airplane and the process. There are various places to have an adapter repaired or overhauled and varying prices to match. You might get away with a simple repair in the $1,000 range or an overhaul in the $2,500 range. Just for reference, a new Teledyne Continental starter adapter for a Cessna 400 currently lists for $7,792.93. If your Teledyne Continental powered airplane is under warranty, you’ll want to get this addressed straight away. If you’re paying for the replacement, you can delay as long as you want but you’ll never know which start is the last one. The risk is getting stuck at some far away airport on a holiday week end on the family trip to see Mickey Mouse. Great disappointment all around.